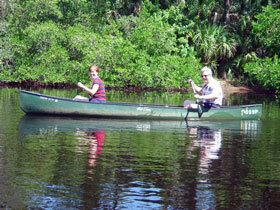 Bennie and Liz Barton weren’t afraid to take their camera along on the canoe trip. I followed along in another canoe and got to take this picture. If you didn’t come out to the picnic on Sunday you missed a very pretty day, especially on the creek. Bennie steered while Liz did all the paddling.